A sunny Saturday afternoon seemed to be the perfect time for Sean O’Connor of Atlanta to start some yard work. “My leg hairs were singed. I could smell the burnt hair,” he continued. Then he saw his steel-toe boots — and they weren’t on his feet. 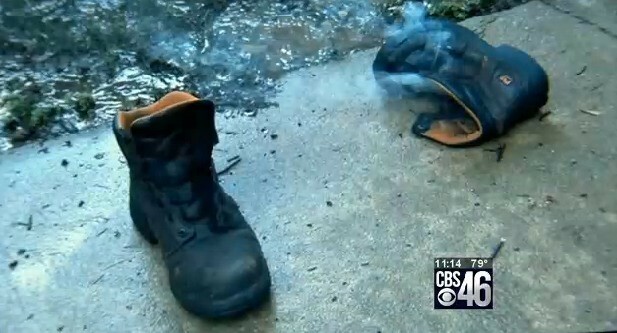 “I looked across the driveway and I could see my boots over there. They were no longer on my feet, and one of them was smoking. At that point I realized I had just been hit by lightning,” O’Connor told the news station. O’Connor, who was alone at the time, called his wife and took video and pictures to prove to her it wasn’t a joke. At the prodding of his wife, O’Connor eventually went to the emergency room to get checked out and was kept over night to monitor his heart rate, according to WSB. “I’ve had a lot of friends comment and ask me if I can now bend spoons with my mind, which I don’t,” O’Connor joked with WGCL. O’Connor just considers himself lucky to be alive. According to the National Weather Service, there have been seven lightning-related deaths so far in 2014 in the United States. O’Connor said there wasn’t any thunder, lightning or other sign of a storm when he set out to do yard work Saturday. Doctors told O’Conner he’s now that it has happened once more likely to get struck again. “Out of all the lightning victims, she’s seen the majority of them end up getting struck more than once,” he told WSB of the doctor’s warning.